The Lego company does many things well. They manufacture a toy that can withstand 950 pounds of force. They injure anyone foolish enough to walk into a child's room barefoot. They get this song stuck in your head...forever. Despite these many successes, Lego's greatest success is still its most obvious: selling tiny plastic bricks. In fact, the company sells more than 45 billion pieces per year. "Cannot approve the use of Legos for political works." Ai's upcoming project focuses on freedom of speech. Lego previously sold Ai Weiwei their product in bulk. The artist used the 1.2 million bricks to create portraits of political prisoners to be displayed on Alcatraz Island. Lego is trying to expand its market in China. As Ai Weiwei pointed out on his Instagram, this includes building a new Legoland attraction in Shanghai. 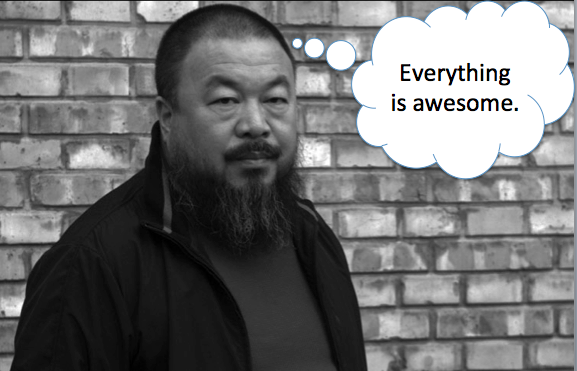 Ai Weiwei and his government don't always click. Given that the artist has been beaten by police, secretly detained for almost three months, and barred from leaving China for four years, this may be an understatement. Ai's art often focuses on themes of censorship, dissent, and human rights. At times, he explicitly criticizes the Chinese government, such as when he accused corrupt government officials of permitting building collapses during the 2008 Sichuan earthquake. So is there necessarily one right way to assemble these pieces? Will you judge me if my Lego Death Star looks like a gray hamburger? While Lego's denial of Ai's request can be seen as either smart corporate policy or censorship, the Ai Weiwei's fans are not waiting for Lego to change its mind. Hundreds of them have already donated Legos to their favorite plastic loving artist.